1 What does soy lecithin have? 1.1 What does soy lecithin contain? 1.5 What are the types of lecithins? 1.8 What other components does soy lecithin have? 1.9 Are lecithin fats saturated or unsaturated? What does soy lecithin have? What does soy lecithin contain? Soy lecithin is a nutritional supplement extracted from soybean oil. The name of this product “lecithin” actually responds to a chemical name of some molecules. This has caused some confusion, even among professionals, because under that trade name there is a product that contains various components. First of all, soy lecithin is an extract from the oil (fat) of soybeans. As it is a purified substance (extract), it does not contain proteins, carbohydrates, isoflavones, antinutrients or fiber, components that can be found in soybeans and their derivatives, but not in the fatty extract. Nutritional composition of soy lecithin per 100 g.
Lecithin contains different types of fats, all of them beneficial. 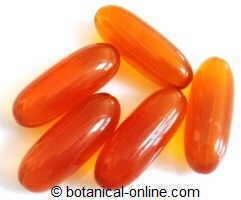 When we talk about lecithin we are referring to a type of fats called phospholipids. The most important thing about phospholipids is that they provide beneficial substances such as choline and inositol. More specifically, according to the chemical definition of phospholipids (lecithins), its composition consists mainly of a molecule of glycerol, linked to two fatty acids and a phosphatidic acid (phosphoglycerides). This molecule is linked to other substances, such as amino acids, through phosphatidic acid. This results in a large molecule called phospholipid. Depending on the type of substance to which phosphatidic acid binds, different types of phospholipids (types of lecithin) result. What are the types of lecithins? Depending on the type of molecule linked to the lecithin (phospholipid), the name of the lecithin is changed: phosphatidylcholine, phosphatidylserine, etc. Phosphatidylcholine (phospholipid bound to a choline) around 29-31.7% of total phospholipids. 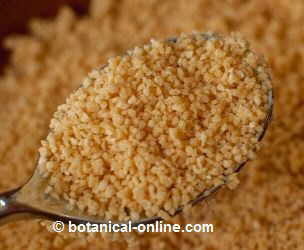 Vulgarly or popularly it is called lecithin and it is the most abundant component in soy lecithin. Phosphatidylethanolamine (phospholipid attached to an ethanolamine) around 20.8-23% of total phospholipids. It is vulgarly known as cephalin and is one of the most abundant phospholipids in the human body. Phosphatidylinositol (phospholipid bound to an inositol) around 15-17.5% of total phospholipids. Inositol is involved in many functions of metabolism, in the proper functioning of the nervous system (essential for neurotransmitters act properly), fertility, and is necessary for healthy skin, nails and hair. Phosphatidylserine (phospholipid bound to a serine) around 3% of total phospholipids. This component is used in sports nutrition for its properties for the nervous and neuromuscular system: to accelerate recovery after training, pain, well-being and for its possible ergogenic properties. In the body, these substances can be “cut” from each other and therefore it is possible to obtain the different components that make them up. The advantage of soy lecithin compared to lecithin extracted from eggs is that soy has a higher percentage in phosphatidylinositol. What other components does soy lecithin have? Phytosterols (in the form of glycosides), approximately 5%, such as beta-sitosterol (β-sitosterol), sitostanol, etc. Triglycerides in variable proportion, according to the quality of the extract. In some analyzes it consists up to 35% of the product. Are lecithin fats saturated or unsaturated? Nutritional composition of soy lecithin fats per 100 g.
The following table shows the nutritional composition of soybeans, soybean sprouts and soybean lecithin, in a comparative way. The most remarkable thing about reading the table is that soy lecithin contains only fats, and therefore has a nutritive value totally different from other soy foods. Nutritional composition of soy per 100 g.